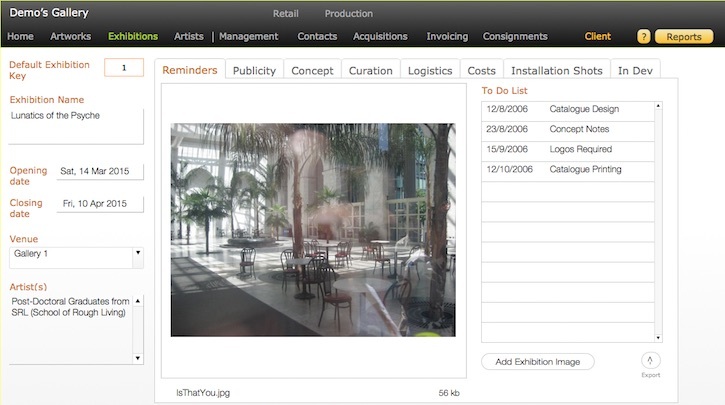 The Stockroom is an artworks management system that gracefully handles all the essential details so that you can focus your energy and expertise on the artworks themselves. Every part of it has been thoughtfully designed to make your time more productive. As well as all the usual text-based search options, you can also move easily through The Stockroom just by clicking or tapping the images. This makes the experience visually logical and a tactile treat. Artworks may be beautiful, challenging, or inspiring. 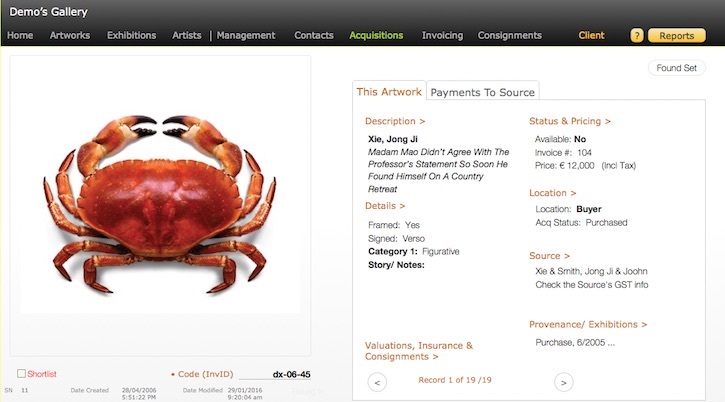 In comparison, the record keeping tasks can seem like a bore however they protect the long term value of the works. The Stockroom makes these tasks effortless - even, interesting. 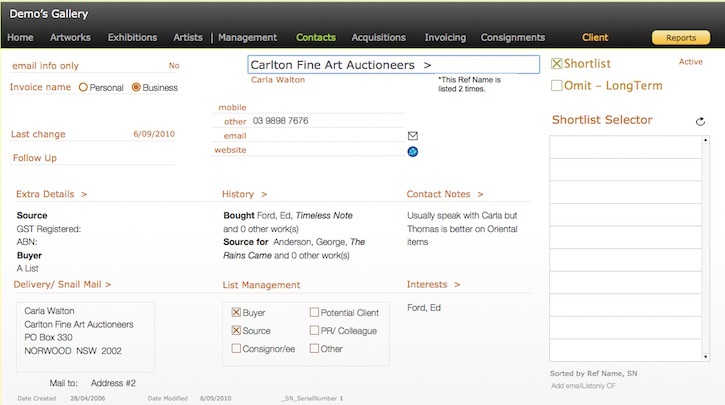 From contextualising your artists and their work, to profiling your clients and their interests, to building a body of research around related works, The Stockroom helps you build your own rich data. 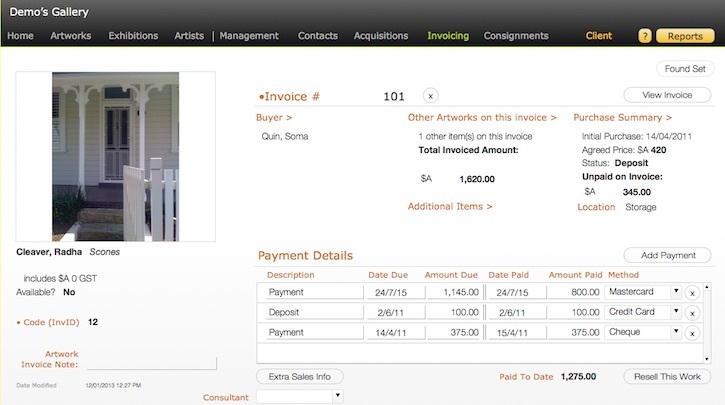 The Stockroom creates visually pleasing invoices and handles complex payment schedules on sales, purchases or leases in a straightforward manner that doesn't require an accounting degree. You can keep your information on your own, private devices - Macs, PCs, iPads, iPhones - or store it on a personal server or in the cloud. Choose whichever strategy is best for you. The Stockroom works in any configuration. The Stockroom has been designed specifically for the Australian environment but it is at home elsewhere in the world. The regulatory settings are user-customisable - GST/ VAT/ Sales Tax, base currency, sales price inclusive or exclusive of the tax component, resale royalty calculations. Please email or call to discuss your specific needs. Wish lists are welcome. Quotes are based upon the number of licences required, along with any additional needs such as hosting and/or data migration.